A combined Anglo-French fleet was a key element of the secret Treaty of Dover, signed between Charles II and Louis XIV on 1 June 1670, which set out their plan for a joint attack on the United Provinces of the Netherlands. The marquis de Seignelay, son of France’s principal minister, Colbert, went to England in November 1671 to complete the detailed arrangements for its organisation . Seignelay joined with two other French negotiators, the Huguenot officer des Rabesnières-Treillebois (who would perish as rear-admiral of the French fleet at the battle of Solebay) and the French ambassador in London, Colbert de Croissy, and their discussions with Charles II’s ministry culminated in January 1672 in the so-called ‘secret treaty of Whitehall’. This was signed inter alia by the Earl of Sandwich, holder of the high honorific position of vice-admiral of England, despite his serious misgivings about the principles underpinning the war. ‘Fine tuning’ of the agreement was subsequently undertaken by Captain Francis Digby, an experienced naval officer, second son of the Earl of Bristol and one of the principal models for my fictional hero Matthew Quinton, who spent March and April 1672 in France. He met Louis XIV at Versailles on 1 March and had several meetings with Colbert over the next few days, working alongside Charles II’s ambassador to France, ‘the almost indecently ambitious’ Ralph Montagu. Not surprisingly, the French rejected out of hand Digby’s suggestion that their captains and ships should have English commissions and colours, on the grounds that ‘his Christian Majesty never could suffer his captains to take commissions but from himself’. Despite this and some other disagreements, Digby’s negotiations were complete by 12 March. After leaving Paris, he undertook a tour of inspection to Brest and La Rochelle, having ‘the same liberty of visiting the ports and ships as was allowed to Mr de Seignelay in England’, before returning to England to take command of the Second Rate Henry – dying in battle, like his French counterpart des Rabesnières, at Solebay on 28 May. The terms as eventually agreed in the Seignelay and Digby missions went some way toward eliminating the most obvious potential causes of discord. After some argument between Digby and Montagu on the one hand and Colbert on the other, the British crown’s claim to the ‘salute to the flag’, which had caused so many problems in diplomatic relations with France during the 1660s, was suspended for the duration of the war; in practice, when the two fleets finally joined on 7 May 1672 some of the French ships did salute the British flagship while others did not. As the secret treaty of Dover had specified, the overall command of the combined fleet was given to James, duke of York and Albany, Lord High Admiral of England, who had commanded the British fleet at the battle of Lowestoft in 1665. In terms of both experience and social rank, the king’s brother was the obvious commander-in-chief, and his appointment avoided some rather awkward political problems – the French had expressed an unwillingness to serve under the other two likely candidates, Prince Rupert of the Rhine and Sandwich, both of whom opposed the war and one of whom (Rupert) was known to be almost virulently anti-French. Appointing James ensured that the comte d’Estrées, vice-admiral of France, could be appointed second-in-command with no loss of national prestige, especially as James was given a French as well as a British commission, but d’Estrées’ almost complete lack of seagoing experience necessitated a clumsy compromise by which Sandwich, who was to command the rear squadron, was to leapfrog to the supreme command if James was incapacitated or absent. In practice, this principle of always having a British officer in overall command applied only to the main fleet; on other occasions, even vastly more experienced British captains, like Sir Richard Haddock (bringing a squadron from Portsmouth to the fleet in May 1673), were placed under the orders of the French, and it was accepted from the beginning that if a substantial British squadron was to be sent to the Mediterranean at any point during the war, it was to be under French command. The flag officers and captains appointed to command the combined fleet for the 1672 campaign were probably as distinguished and experienced a body of naval officers as the British and French kingdoms could muster. In the Duke of York’s own squadron, the Red, the vice-admiral’s flag was given to Sir George Ayscue, one of the few well-born officers to have held high command under the Commonwealth (he was a godson of George Abbot, Archbishop of Canterbury, and his knighthood had come from King Charles I). Ayscue had also commanded a Swedish fleet, and had recovered from the disgrace of being the only British admiral ever to surrender in action, a ‘distinction’ that he still holds; his flagship, the Prince, ran aground and was surrounded during the Four Days’ Battle (1666), and Ayscue was held prisoner at Louvestein Castle in the Netherlands for over a year. The rear-admiral of the Red, Sir Joseph Jordan, was a seventy year old veteran and sometime staunch parliamentarian. Sandwich was appointed Admiral of the Blue with the Irish cavalier Sir Edward Spragge as his vice-admiral and Sir John Harman, another former parliamentarian, as rear-admiral. The careful selection of this command group was undermined by the death of Ayscue on 5 April. Ten changes of ship or flag resulted: Spragge and Harman moved to the Red to serve under James, flying their flags in the London and Charles respectively. Jordan moved to the Blue as vice-admiral, taking as his flagship the huge and venerable Sovereign, and the vacancy as rear-admiral of the Blue was filled by Sir John Kempthorne, a former cavalier who had distinguished himself in a dramatic single-ship battle against a Barbary corsair squadron in 1669 and who now hoisted his flag in the ancient Second Rate St Andrew. These appointments exacerbated an already tense atmosphere in the officer corps, which was riven by factions based partly on the old political lines of ‘cavaliers and roundheads’ and partly on newer, more personal animosities. Sandwich’s return to high command alienated many: he had been disgraced following a unilateral distribution of the cargoes of lucrative prizes captured by his fleet in 1665, and he knew full well that ‘I must do I know not what, to save my reputation’, as he told his friend John Evelyn. 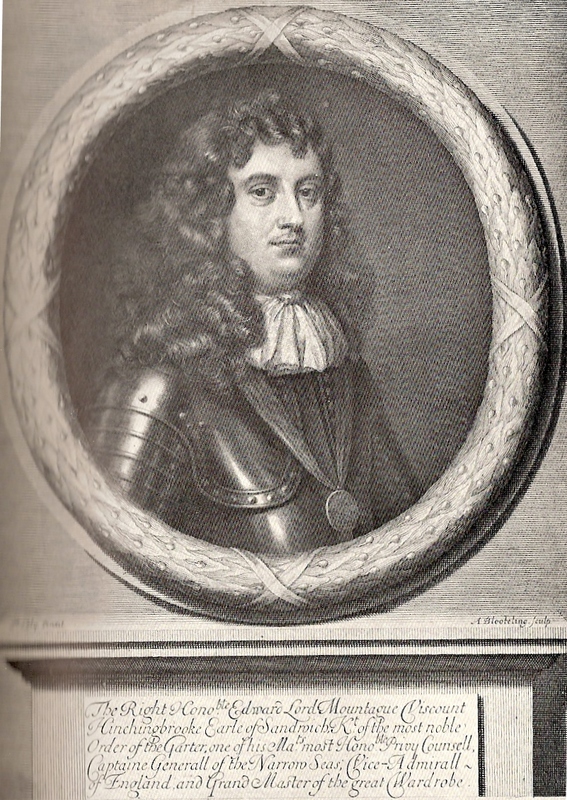 Sir Robert Holmes, the chief naval client of Prince Rupert (who was given shore responsibilities as de facto acting Lord High Admiral), was overlooked for the vacancy caused by Ayscue’s death, and this merely fuelled his resentment against his old friend Spragge, who had moved from Rupert’s to York’s orbit and had benefited accordingly. Several of the more junior captains nursed their own grievances and ambitions for promotion. Thus the officers entrusted with the task of destroying the Dutch state were very far from being a ‘band of brothers’, even before they were joined by a new, unknown and automatically suspect set of comrades-in-arms, the French. The command of the French squadron was held by Jean, Comte d’Estrées, son of a Marshal of France and nephew of one of King Henri IV’s legion of mistresses. Originally an army officer who had risen to the rank of lieutenant-general in the 1650s, d’Estrées transferred to the sea service in the 1668 and by 1672 was the senior French commander in the Atlantic. An arrogant and abrasive character whose relations with his subordinates were often difficult, d’Estreés hoisted his flag in the Saint Philippe, a relatively old seventy-eight gun ship. D’Estrees’ second-in-command was the sixty-two year old Abraham Duquesne, flying his flag in the new Second Rate Terrible and commanding the van division of ten ships. A Huguenot from Rouen, Duquesne had risen to the very top of the French officer corps despite the impediments of his religion and low birth (he had begun his career in merchant ships). The two remaining French flag officers were Des Ardents, ‘un excellent et vaillant officier’, commanding the Tonnant and acting as d’Estrées’ second-in-command in his centre division of eleven ships. La Rabesnieres-Treillebois, another Huguenot and one of the architects of the naval alliance, commanded the rear division of nine ships, flying his flag in the Superbe. Six of the French captains were singled out by Seignelay as ‘les bons ouvrirs’; their number included the future admiral the comte de Tourville, then thirty years old and captain of the fifty-gun Sage. Although the commanders of the French squadron were undoubtedly as strong a group as Louis XIV could have provided, the same certainly was not true of the ships they commanded. The largest ship was the Saint Philippe, which carried fewer guns than eleven ships in the two British squadrons; none of the huge new First Rates built at Brest and Toulon in the late 1660s were allocated to d’Estrées. However, this may have been due to concerns about the sailing qualities of the new ships, a consequence of the difficulty of providing the huge crews that would be required to man them, or else simply a realistic reflection of the opposition that they were expected to face. The largest ship in the Dutch fleet employed in the summer of 1672 carried only eighty-two guns, and the smaller French ships were certainly more akin to the majority of Dutch ships than the generally overgunned and frequently sluggish British vessels, which carried their guns much lower in the hull than their lighter, faster and often more manoeuvrable French counterparts. Attempts to achieve genuine co-operation between the British and French squadrons were made in many ways, both large and small. Tactical arrangements were clearly going to be crucial to the hoped-for success against the Dutch navy, and one obvious requirement of tactical co-operation was met from the beginning: French translations of all the relevant sailing and fighting instructions were provided to d’Estrées’ ships. In these areas, the French were clearly expected to conform to British practice, and this is most strikingly the case in the area which was probably to cause some contention between the two nations than almost any other, both during and after the war – the signalling system. The French fleet was incorporated into the system of flag signals which the British had used since at least the time of the second Anglo-Dutch war. This entailed giving each ship in a division a number between one and fourteen, although the variable size of divisions meant that not all numbers were allocated; a specific signal corresponding to each number indicated that the admiral wished to speak to that particular vessel. Therefore, Le Téméraire, the second ship in the French rear-admiral’s division in August 1672, was allocated flag number six, so that her divisional signal consisted of a white flag with a pendant flying from the foretopmast downwards on the backstays, while her individual signal flew from the foretopsail yard. There was considerable interest and curiosity on both sides in the qualities of each other’s ships. At the first juncture of the two fleets in May 1672, British observers were particularly impressed with des Rabesnières’ ship Le Superbe, which was visited (along with several other French vessels) by both Charles II and the duke of York, and which Samuel Pepys claimed became the model for most of the new British third-rates built in the mid- and late 1670s; the French ships in general were felt to be well-designed and lacking in superfluous clutter, although there were mixed reports of their manning levels and some criticism of their guns, which were thought to be lighter than and inferior to their British equivalents.